Jarno's orange and silver NEStoaster, one of two works featured on his DeviantArt page (via Neatorama), no longer makes toast of course, though a clever NES cartridge sleeve reminds us of its original function. The perfect place for a console made even more perfect. Of course Jarno is not the first to mix game console and toaster; he's not even the first to mix NES and toaster. Our first Kotaku sighting of this exquisite combination comes from way back in the year 2008, followed up in 2009 by a Super Nintoaster. Super Nintoaster — It&apos;s for Breakfast Now! 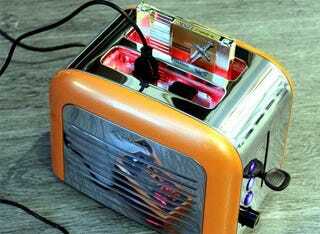 We've even see a four-slot Xbox 360 toaster as recently as 2011, the daring 2D bagel of the console toaster world. Jarno's concept isn't novel, but his execution is flawless and should be held up as a standard for console toasters to meet or exceed in the future. It's the difference between roughly forcing one devices innards inside another and convincing them with gentle voice to lay together and become one. Man, I could really go for some toast right now.